Oilcraft Premium Rose Water - This rose water is manufactured using Kannauj roses by steam distilled method (Read what is special about Kannauj roses and steam distillation here). In short - a dupe of Kama Ayurveda at half the price. 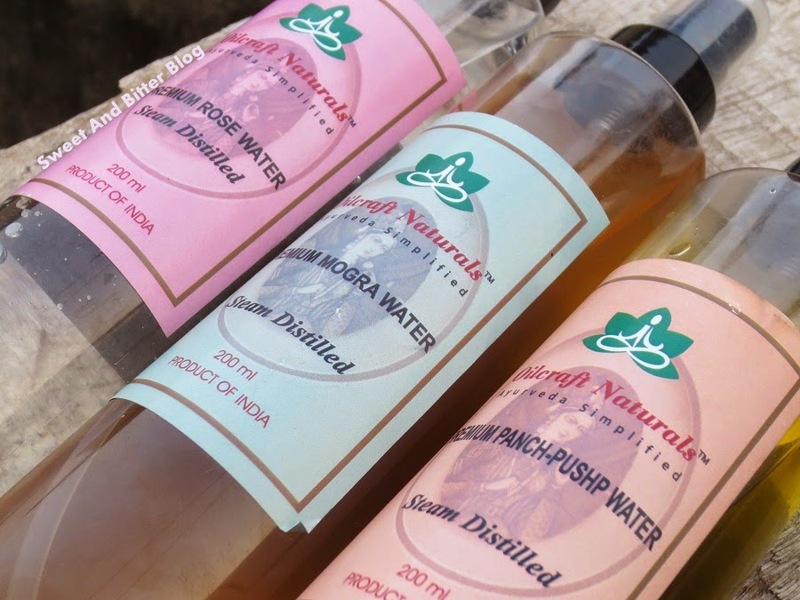 Unlike other rose water which contains rose oil and water, this is the stream distilled water of rose. Hence, the smell is mild and not as intense as other normal rose waters. But, Oilcraft is more fragrant than the Kama one. I like to use it before applying Kama Kumkumadi Thailam. I am really pleased with this. 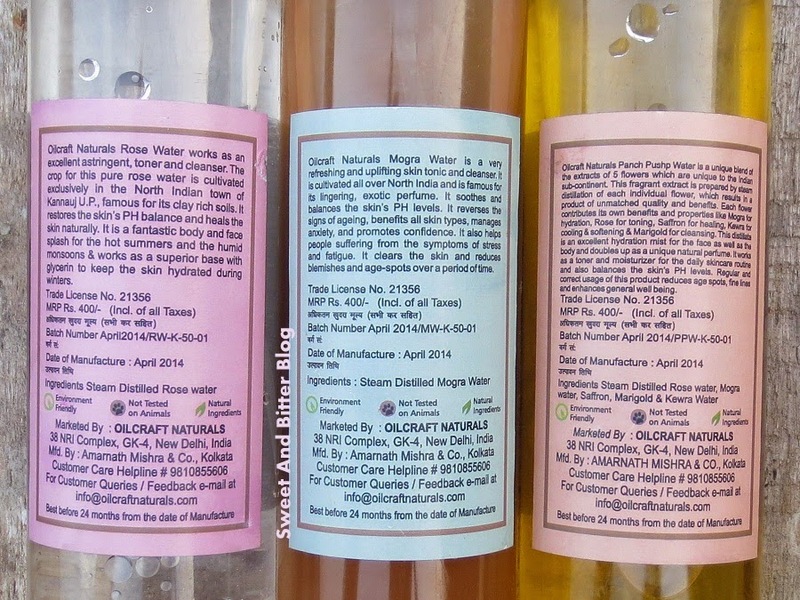 Oilcraft Premium Mogra Water - This is the first time I used mogra water. The smell is like wet flowers. This is not very fragrant. Hence, it is not as refreshing as the rose water. I like to mix it with face packs or use it just as face mists. Oilcraft Premium Panchpushp Water - Panchpushp means the blend of 5 flowers for the unique benefit of each flower - Mogra for hydration, Rose for toning, Saffron for healing, Kewra for cooling & softening and Marigold for cleansing. But, of all the flowers, I could only smell kewra. Sadly, I am not a fan of Kewra and have used it as face mist just once. I have given it to my friend who uses this with Kumkumadi thailam. They come in only 200ml bottles and hence, quite bulky to travel with. I have transferred it to an old spray bottle to keep it in my bag. Overall - Oilcraft Naturals manufactures premium water by steam distillation method. 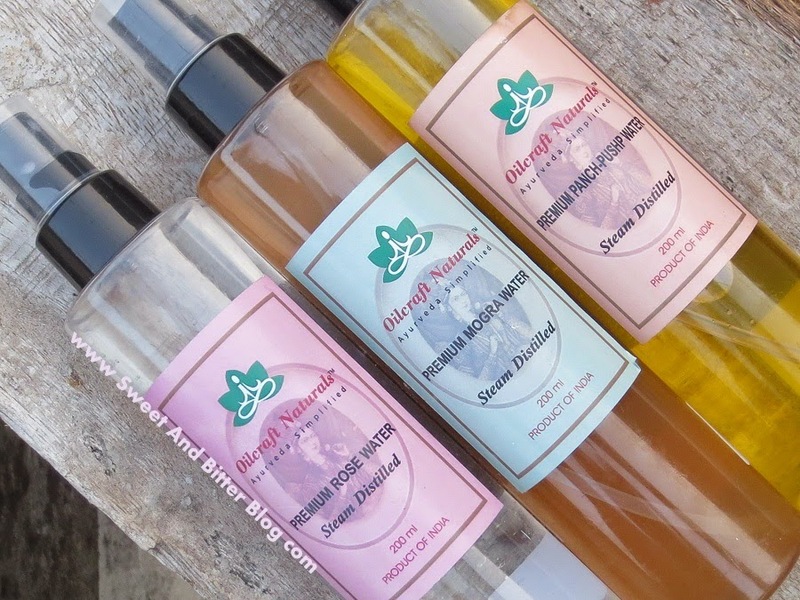 The products are environment friendly, not tested on animals and made of natural ingredients. Availability and packaging is an issue. But, as long as they are available online and I can transfer them to smaller travel bottle, I am okay with that.